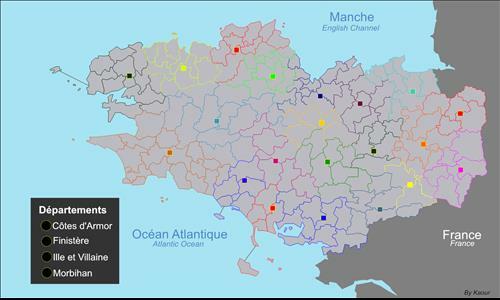 Carte de la région Bretagne, en France. Map of Brittany, in France. Review by Ranek on 11/2/2016. the map is visually appealing, but has some minor issues unfortunately. there are too many too big bonuses. A map with less than 200 territories shouldnt have bonuses with more than 7 territories in my opinion. your average is 8 territories per bonus. I would recommend to split the big bonuses into two to four smaller bonuses. the values for the super bonuses are way too high. and last thing the borders overlap. you have no curved borders. so it wouldnt be such a big effort to separate border lines. this map has a lot of potential, it is a good first attempt, though. Review by Andalorium on 1/2/2017. The bonus area sizes were very big for not very many units, making for a slow start. Review by CunoThe1 on 11/2/2016. The map looks just good, nothing special. The bonusses are not good, in the west the areas are to large making it easy to block 11 income just by taking 1 territory. and most of the times these are all his income. Also Départements are OP! When i got a full Département I went from second in the match to first. In the beginning the game was fun, picking territories and losing territories. But once someone has a Département - 2 territory border, he has immideatly won, and there is noone who can stop him.